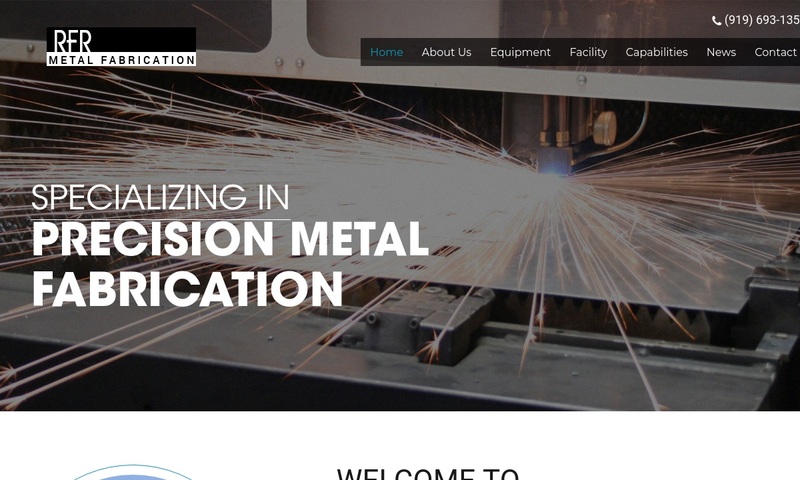 A reliable source for Sheet Metal Fabrication information and a resource for accessing leading Sheet Metal Fabrication and suppliers. The process by which sheet metal is formed into usable sheet metal parts and products is called sheet metal fabrication. Sheet metal fabrication services feature a variety of fabrication processes, such as bending, drawing, flanging, punching, shearing, spinning, and stretching. All sheet metal fabrication processes seek to create high quality, long-lasting parts and products, while reducing material and labor costs. Sheet Metal Fabrication Manufacturers The process by which sheet metal is formed into usable sheet metal parts and products is called sheet metal fabrication. Sheet metal fabrication services feature a variety of fabrication processes, such as bending, drawing, flanging, punching, shearing, spinning, and stretching. 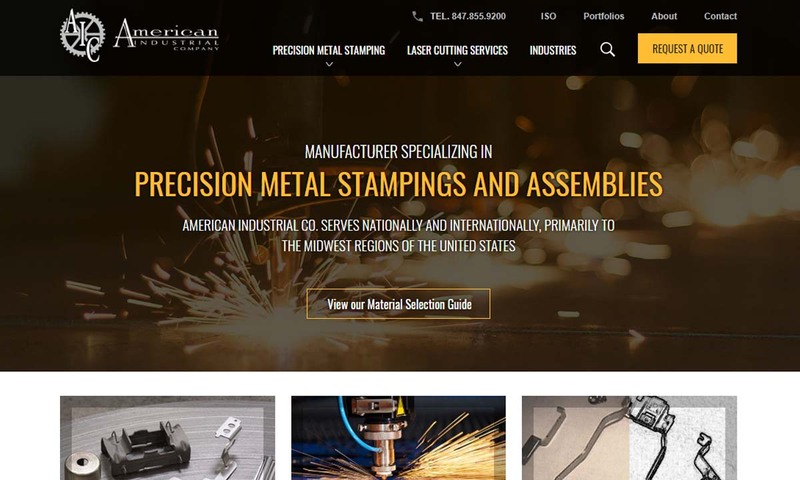 Since 1981, American Industrial has been on the cutting edge of all things sheet metal. This has helped us achieve our spot as a leader of the industry. 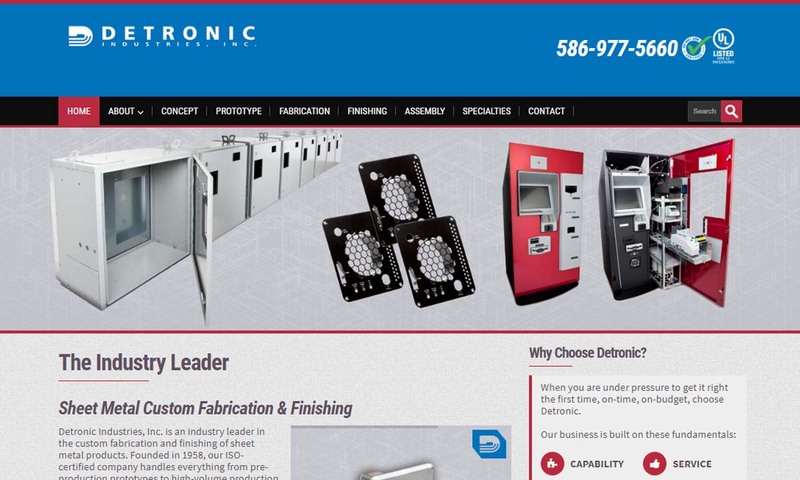 Detronic Industries is an industry-leader in custom sheet metal fabrication, including sheet metal products. We are sheet metal fabricators, servicing industries such as the computing, financial services and health care fields. 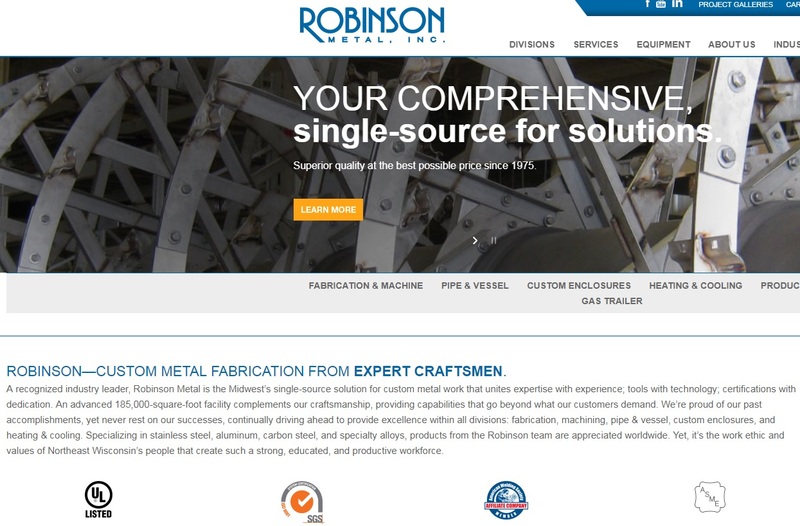 The sheet metal fabrication division at Robinson Metal specializes in stainless steel as well as aluminum, carbon steel & polycarbonates. We guide you through each phase of your metal fabricating project from design to production. 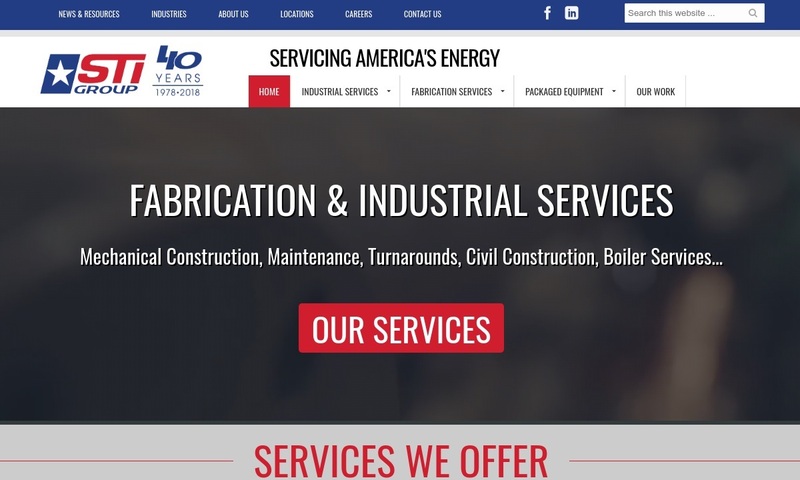 The STI Group provides you diversified service capabilities for your industrial capital construction, maintenance, piping spools, heavy structural steel & plate, sheet metal, modular, material processing, vessel fabrication, boiler & heater, and more. Precision sheet metal fabrication service providers can use their capabilities to create a wide variety of parts and products. Examples of some of these parts and products include metal furniture (stainless steel storage units, metal cabinets, steel shelving, etc. ), stairwell railings, fencing and cages, HVAC industry parts (ductwork, grating, venting, etc. ), lighting hoods, scissors, structural elements (stainless steel bridge skeletons, aircraft framework, etc. ), and silverware. Humans have been manipulating metal since we discovered copper thousands of years ago. The oldest example of a fabricated metal product that contemporary humans have is a pendant, found in what is now northern Iraq, dating from around 8700 BC. Nearly as old are the handheld copper hammers found in present day Michigan and the surrounding Great Lakes region. The people who made these hammers between 5000 BC and 4000 BC did so with the assistance of heat, probably from a fire. During the times of the ancient Egyptians, Greeks, and Romans, humans picked up many important metalworking skills, such as stamping, engraving, bending, and cutting. The first person to record the idea of sheet metal fabrication was Leonardo da Vinci. In 1485, he sketched his idea for a rolling mill. The first successful rolling mill that we know of was built in 1501. This one and others of the time were not as complex as the one Da Vinci had drawn, though. Workers at early mills rolled metal for a number of reasons. For example, some created gold metal sheets with which they stamped coins, while others cut and recut metal sheets into strips. The first sheet metal rolling mill to go up that mirrored da Vinci’s ideas was built in 1590. At this mill, workers used a mill machine that flattened metal between two cylinders. By doing so, they were able to perform higher precision sheet metal fabrication than they had before. In 1615, investors built the first factory dedicated to lead plate and tin plate production. Nearly seventy years later, in 1682, the first cold roll mill went up in England. About eighty years after that, around 1760, the Industrial Revolution began. With the advent of new machinery and new products, sheet metal fabrication became more widespread. To accommodate the growing sheet metal fabrication industry, inventors built new machines, like press brakes. In 1770, famed inventor and locksmith, Joseph Bramah designed the hydraulic press. This invention significantly increased the precision capabilities of metalworkers who pressed metal sheet. Also, around this time, engineers came up with the assembly line process. Using an assembly line helped streamline the sheet metal fabrication process. During the 1800s, one of the “big things” in the metal fabrication industry was the use of aluminum. Scientists had discovered its existence towards the beginning of the century. Towards the middle of the 19th century, industry metalworkers also began making a lot more steel sheets. This was in thanks to Henry Bessemer, a British inventor who designed and patented the first usable method for turning iron into steel. As technology has advanced, custom sheet metal fabrication has become more precise and more efficient. Precision sheet metal products may be produced on automated lines with robotic machinery that turn and move them as necessary. CNC machinery has also revolutionized the quality of metalworking by allowing for more accuracy and uniformity. With modern custom sheet metal fabrication, the possibilities really are endless. Two of the most common metal materials used to create precision sheet metal are stainless steel and aluminum. Stainless steel is valued as sheet metal because stainless steel provides strength, durability, corrosion resistance, and easy cleaning. These qualities prove valuable in harsh environments and to the manufacturing, food processing, and storage industries. Aluminum is popular because it offers compressive strength, tensile strength, and lightness. Aluminum sheet metal products have applications in aerospace, automotive manufacturing and other transportation industries, and the packaging, construction, food and beverage, music, household, and electronics industries, among others. Other metals used to create sheet metal include brass, copper, nickel, titanium and, for specialty applications, gold, silver, and platinum. Before a piece of sheet metal can be formed into any part or product, manufacturers must form the sheet metal itself. To get it to reach its rectangular sheet form, sheet metal workers heat raw metal is until it is malleable. Then, they lay it out as long, molten slabs. After this, they feed the slabs of precision sheet metal through a set of large, powerful rollers. The rollers compress the metal slabs into large, broad planes, or sheets. After metalworkers create the sheet metal, they cut it to size and send it on to another manufacturing plant. At the next location, the metal sheet undergoes design and fabrication. At this point, manufacturers create a design. Sheet metal design is the process of identifying any and all potential stress points, weak areas, and other potential problems a finished product may face, and formulating and carrying out a comprehensive plan of action to ensure that the product does not fall victim to any of these potential issues. During this part of fabrication, manufacturers manipulate the metal sheet so that it can become the product they wish to make. To do so, manufacturers may participate in any number of metalworking processes, including machining, cutting, sawing, shearing, drilling, perforating, stretching, rolling, bending, spinning, ironing, stamping, sanding, deburring, blanking, and welding (spot welding, MIG welding (metal inert gas welding), TIG welding (tungsten inert gas welding), stick welding, etc.). Heat treatment is an optional step, but metalworkers almost always take the opportunity to perform it. Manufacturers heat treat metal parts to either harden and strengthen them, or soften them for further working. Some of the most common heat treatment methods include tempering, quenching, and annealing. Finally, if a precision sheet metal product consists of multiple parts, manufacturers often assemble them before shipping it out. When deciding how to fabricate a custom metal part or parts, manufacturers factor in specifications like product purpose, required product strength, product quantity request, standard requirements, required material characteristics (corrosion resistance, impact resistance, heat resistance, etc. ), and the like. Sheet metal fabricators can create virtually any piece of custom sheet metal or custom sheet metal products. They can vary custom products by shape, size, complexity, materials, and more. To find out more about custom fabrication, talk to your potential suppliers. Sheet metal fabricators may perform sheet metal fabrication manually or with the guidance of a computer operated (CNC) machine. Sheet metal fabricators have at their disposal a wide range of equipment in their sheet metal fabrication shops. Some of the many machines that sheet metal fabricators use, CNC controlled or otherwise, include punch and die machines, automated lines, press brakes, and various tools, such as drills and laser cutters. Punch and die machines form products from sheet. To use them, manufacturers first secure one or more flat metal sheets on a designated surface. Once the workpiece is in the place, the punch comes down and literally punches the metal sheet. 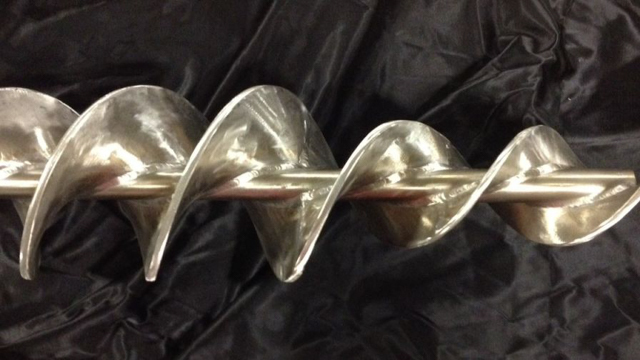 The metal then deforms and takes on whatever shape the punch has. Alternatively, manufacturers can place metal sheets on top of a die, and then use a press brake to press the metal into the die. Automated lines are assembly lines that use robot workers instead of humans. Automated lines are incredibly efficient, and less likely to yield errors. They are most common in large factories. Press brakes are machine brakes that metalworkers use to bend sheet metal. Often, metalworkers use press brakes in conjunction with other equipment, like shaped dies or punches. Drills are cutting tools with rotating tips that manufacturers use to create holes in material. Laser cutting tools use laser beams to make extremely clean, high quality cuts. 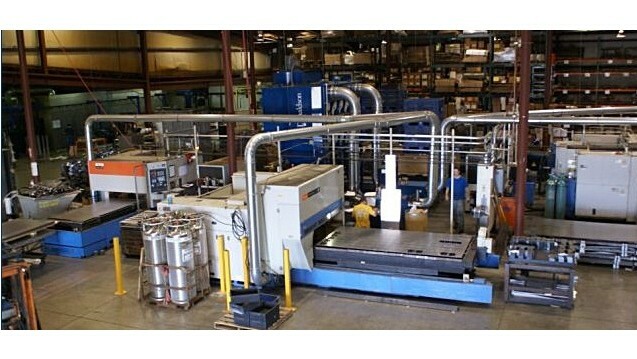 As we noted earlier, some of the basic sheet metal fabrication and machining processes (CNC or manual) include bending, drawing, flanging, stretching, punching, shearing, and spinning. Bending is typically carried out on a standard die set, where the most common bends produced include C-shapes, V-shapes, and channel shapes. During bending, the bending machine bends or deforms the metal along a straight line. Drawing, as well as deep drawing, are stamping processes that transform flat sheet metal into any number of three-dimensional forms. Flanging is another stamping process. During flanging, manufacturers bend material along a curved line. Stretching is yet another stamping process. Stretching involves clamping flat sheet metal around its edges and then stretching it to create products like smooth auto body parts. Punching pierces sheet metal when, after the metal has been placed between a punch and a die mounted in a press, the press pushes the punch into the die with enough force to create a hole. In addition, sometimes, the punch and die “nest” together to create a depression instead of a hole in the metal. Punching should not be confused with perforating, which is a process that produces multiple small holes on a flat surface. Shearing is a cutting method that uses large shears to slice into sheet metal. Next, spinning uses rigid tools or rollers to hold a heated sheet in place against a rotating form, or mandrel, where it stretches it until it forms a tubular part. Most often, manufacturers use this process to fabricate satellite dishes, metal kitchen funnels, rocket motor casings, and missile nose cones. Some other sheet metal fabrication and machining processes include wheeling, water jet cutting, rolling, roll forming, press brake forming, photochemical machining, laser cutting, ironing, incremental sheet forming, hemming and sealing, hydroforming, expanding, curling, and decambering. To find the best supplier for you, we recommend that you check out the list of quality sheet metal fabrication suppliers that we have posted on this page. Before you start looking over our list of suppliers, take some time to write down your specifications, questions, and concerns.  Make sure to include information like your budget, your timeline/deadline, your quality standard requirements, your delivery preferences, and your post-delivery preferences (installation assistance, parts replacement, maintenance, etc.). Once you have written down all of your specifications, you can start looking at the sheet metal fabrication suppliers that we’ve listed. Use your specifications list as a guide. Compare and contrast the capabilities and offered sheet metal fabrication services of each supplier with what you have written down. Based on that, pick out three or four suppliers in which you are interested. Then, reach out to each supplier and discuss your application at length. After you have spoken with representatives from each supplier, decide which company can best fit your needs, and go with them.